Join the 464th TCW Email group! Several generations of airlifters have called Pope Air Force Base, next to Fort Bragg, North Carolina the "Pea Patch," and with good reason, though most modern airlifters don't know it. For at one time, the ground now occupied by Pope was a pea patch! The field itself was established during World War I and was named for an Army aviator who died when his airplane crashed into the Cape Fear River. During World War II, a pea patch adjacent to the Army Air Field that had been established there before the war was turned into a training camp for glider pilots. Several troop carrier and glider groups passed through Pope during the war as they made their way to join combat units overseas. After the war Pope was home to various troop carrier groups flying C-47s and C-119s. In 1954 the 464th Troop Carrier Wing was transferred to Pope. The 464th remained at Pope until the early 1970s when it was replaced, in name only, by the 317th Tactical Airlift Wing. 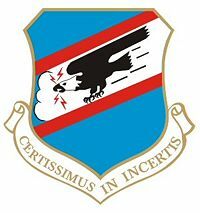 In the early 1990s the 317th designation was inactivated and Pope became home to the 23rd Air Combat Wing, which flew fighters and C-130s. In the late 1990s the C-130s were withdrawn from the 23rd ACW and assigned to the Air Mobility Command under the 43rd Airlift Wing. The 464th designation came into being when the 464th Bomb Group (H) was constituted at Wendover Field, Utah on 19 May, 1943. Equipped with the B-24 Liberator, the group moved to the Mediterranean and joined the Fifteenth Air Force in the air war over Europe where it earned the Distinguished Unit Citation. When World war II ended, the 464th designation was inactivated. It came back into the Air Force when the 464th Troop Carrier Wing was activated at Fort Benning, Georgia with C-119s. On September 16, 1954 the 464th Troop Carrier Wing moved to Pope from Lawson Field, an Air Force Base next to Ft. Benning, Georgia. The group's mission was supporting the Army's airborne forces, including the famous 82nd Airborne Division which was based next door at Ft. Bragg. In the late 1950's the 464th traded in its Dollar Nineteens for Fairchild C-123 Providers, twin-engine transports with excellent short-field landing characteristics. That Pope was home to a C-123 wing was appropriate, since the Provider was a powered version of the CG-20 glider Chase Aircraft had developed for the Army Air Forces during World War II. But the C-123 was destined for a short association with the Air Force as the newer and considerably faster C-130 was taking Tactical Air Command by storm. By 1960 the 464th at Pope was the only wing in the Air Force still flying the C-123, and the Providers were already set up to go to the reserves. But something was brewing in Southeast Asia, where the Communist government of North Vietnam was busy promoting revolution among its brothers in the non-Communist South. A major guerrilla war had developed and the United States under President John F. Kennedy was determined to help. A counterinsurgency panel meeting in Saigon had determined that a lack of airlift was a major short-coming of the South Vietnamese military. The C-123s at Pope were seen as the ideal airplanes for the kind of flying necessary in the rugged boondocks of South Vietnam. From December, 1961 until the spring of 1963 the 464th rotated aircraft and crews from Pope to Tan Son Nhut and Da Nang for airlift duties in South Vietnam. Popularly referred to as MULE TRAIN, after the military codeword for the first squadron to be deployed, the Pope C-123 mission was the first conventional US Air Force unit to see action in Vietnam. MULE TRAIN crews functioned like bush pilots in a rugged land where few runways were paved and where every Viet Cong with a rifle took potshots at every airplane they saw. In the spring of 1963 the C-123 mission in Vietnam was permanently assigned to PACAF and the Pope crews were replaced by PCS personnel taken from the Air Force at large, though one squadron transferred as a unit from TAC to PACAF and from Pope to Da Nang. Most of Pope's C-123s went to Vietnam while the rest moved to Hurlburt Field, Florida and the 464th began converting to the newest version of the C-130 Hercules , the E-model. In the spring of 1964 Pope crews flew their first operational C-130 mission as they airlifted relief supplies to earthquake victims in Alaska. A few weeks later the 464th began rotating aircraft and crews to Evreux-Fauville AB, France where TAC had established two rotational squadrons to replace the 317th Troop Carrier Wing, which had transferred back to the United States and to TAC. In the summer of 1964 the 464th was tasked to provide a contingent of C-130Es to JTF LEO, a United States Strike Command mission in the Republic of the Congo, where a Marxist-led rebellion was underway against the goverment. LEO crews flew airlift missions in support of government forces, including white mercenaries led by Major Mike Hoare, a Rhodesian soldier of fortune who had fought with the British Chindits in Burma during World War II. In April, 1965 Pope was the launching point for an airlift of the 82nd Airborne Division Ready Force to San Isidro Airfield at Santo Domingo, Dominican Republic as the United States intervened when rebels overthrew the government. A force of 140 TAC and MATS C-130s took off from Pope to drop the 82nd on the airfield, but the mission was changed to airland when word reached Washington that the airfield was in friendly hands. 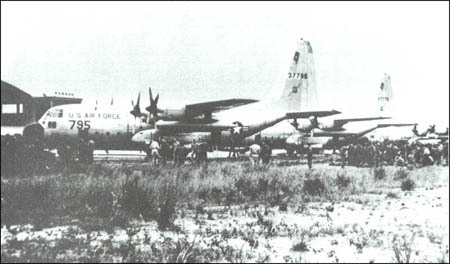 In the spring of 1965 Pope crews returned to Southeast Asia as the 464th provided a squadron of C-130Es for rotational duty with the 315th Air Division in PACAF as part of Project TWO BUCK. One again, the 464th was heavily involved in the war in Vietnam. A few weeks later, in early September, 1965 the entire 779th TCS deployed to tiny Mactan Island off of Cebu in the Philippines to open a new C-130 base as part of SIXTEEN BUCK. In December, 1965 the 776th TCS transferred to PACAF along with several TAC C-130 squadrons. Pope became an RTU for C-130 crewmembers on their way to overseas assignments at Clark and CCK air bases. The 779th returned from Mactan after being replaced by the 463rd TCW from Langely, and began converting into the new C-130 special operations mission which eventually came to be known as Combat Talon . Pope became a testing ground for new airlift techniques. In response to the TET attacks in Vietnam in 1968, Pope crews returned to Southeast Asia as TAC sent additional C-130 squadrons to reinforce those permanently assigned to PACAF. Pope crews participated in supply drops to Khe Sanh, and in the A Shau Valley. In 1971 the 464th was inactivated and replaced (on paper) by the designation of the 317th Tactical Airlift Wing, the unit that had been at Lockbourne and was inactivated as its older C-130As transferred to the reserves. Pope crews returned to Southeast Asia in the spring of 1972 for AWADS airdrop missions. After the Vietnam War, the tactical airlift mission transferred from TAC to MAC, and Pope became a MAC base. After the Gulf War, the Air Force formed new composite wings and the wing at Pope became the 23rd Composite Wing, with A-10s and C-130s assigned, and was part of the Air Force Air Combat Command. Less than a decade later, all ACC C-130s transferred into the Air Mobility Command, which had replaced MAC, and the 19th Airlift Wing activated at Pope to control the C-130 squadrons. Note - As the military has scaled back, Pope transferred from the Air Force to the Army and became the home of an Air Force Reserve unit. The 317th Airlift Wing is now at Dyess AFB, Texas.